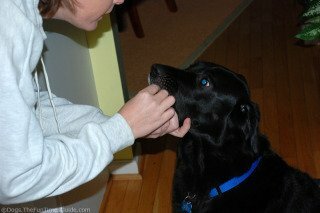 from dogs.thefuntimesguide.com One of the most common types of canine cancer and the number one cause of canine death, cutaneous mast cell tumor, has been treated with steroids and antihistamines and various human oncology drugs for years. Finally, a specific oncology drug for these specific canine cancers has been developed and approved for veterinary use: Palladia (toceranib phosphate) produced by Pfizer Animal Health Inc.
Mast cells have a positive role in helping to protect dogs from inflammation and allergies. But when overstimulated, the chemicals they release, including histamine, heparin, serotonin, and prostaglandins, can actually damage immune function. Unfortunately, what causes the tumors to become cancerous is not known. from Veterinary Practice News Mast cell tumors (MCT) can appear anywhere on a dog's body as pimply-like protuberances or egg-like bulges. There are so many appearances for the tumors, that the only way to know for sure about a skin irregularity like a bump or a pimple is to have it aspirated by your veterinarian. Most MCTs are benign, but approximately 20 percent of them turn out to be cancerous. Cancerous MCTs are classified into three grades with grade I being the least severe and limited to the tumor itself. 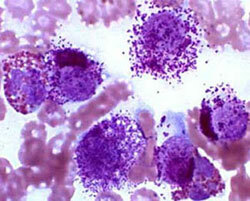 In grade II, the tumor has begun to metastasize, but the cancer is still considered treatable. Grade III tumors are very aggressive and may have spread through the lymph glands to other areas of the body. killing tumor cells and by cutting off the blood supply to the tumor. In its clinical studies, approximately 60 percent of the subject dogs had their tumors "disappear, shrink, or stop growing," according to a Pfizer researcher. Pfizer will introduce its new canine cancer treatment to board certified veterinarians before making it available for use in early 2010.